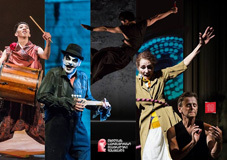 Tbilisi International Festival of Theatre will take place on September 14-30. This year, the audience will be able to enjoy various performances and plays, including the Tiger Lillies, Martial Art in Dance, The Eighth Life (for Brilka), Dialogue in Skin -South East Asia Music, Contemporary Percussion, etc. The Tiger Lillies' music is a startling mixture of opera, gypsy song, and left-bank Paris, but what marks out this band from any others is the emotional charge and raw passion of the delivery. Martial Art in Dance, directed by Zhao Liang, will take place on September 26 at Alexander Griboedov State Russian Drama Theatre. “Those who can stop the war and fight are genuine martial artists/Fighters; when such martial art was performed to the rhythm of the music, the art of dance came into being. Every martial artist knows when to attack and when to defend, highly emphasizing the connection between the ego and the external world,” reads the description of Martial Art in Dance. Master classes, workshops, and exhibitions take place along with the festival every year. The festival gathers a wide range of talents and artists from all around the world with their courageous. Tbilisi International Festival of Theatre was founded by the Tbilisi Municipality in 2009. The Festival, which is one of the major international cultural events in Tbilisi, runs annually at the end of September. It has been a member of the European Festivals Association since 2011. Festival aims to enhance cultural life in Tbilisi and Georgia by the innovative theatre productions and the creative and stimulating performances to integrate Georgia on the international map of culture.